The golf course of the Presqu’ile du Cotentin blends into an exceptional natural site, covering an area of about 50 hectares between coastal sand beaches and Cotentin marsh areas. Designed by Yves Bureau, an architect reputed for the variety of his creation of effects and balances, this course is a challenge for players of all levels.To obtain a good score, you have to be able to master a large variety of shots and count on a gentle sea breeze! 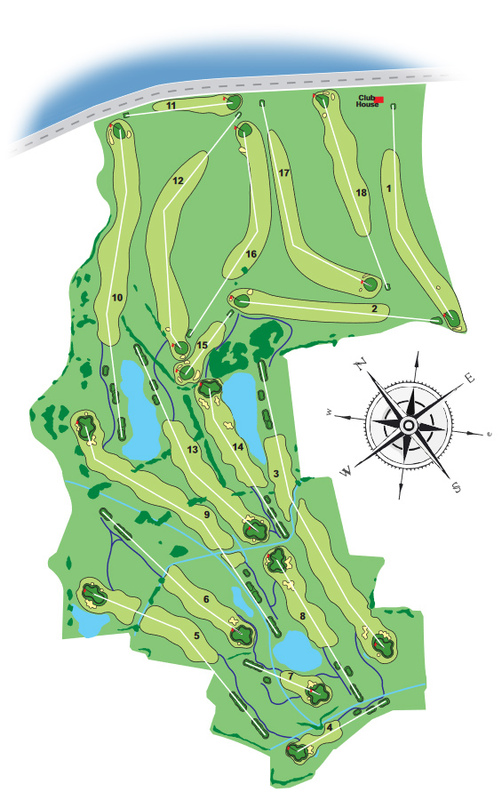 A par 72 course of over 5800 metres starting with the seaside links holes and blending in to the ones in the wooded, swamp area with water obstacles, dense hedges and reed beds. This Norman course is a real challenge for the most demanding players but also makes a lovely walk for the less competitive players who will appreciate its comfort and setting. Alone, in twos, with family or friends, and whatever your level, you will be able to enjoy the pleasure given by « the little white ball » in an exceptional environment. You can expect a wonderful vivifying experience. President of Golf de la Presqu’île du Cotentin.